The king cobra is the world’s longest venomous snake. It can grow to about 18 feet [5½ meters] long and lives in the forests of India and southern Asia. Normally it avoids contact with humans, and does not attack unless it feels threatened. Its venom is highly toxic and could kill a human if they don’t get immediate medical treatment. King cobras may be best known as the snake of choice for the snake charmers of southern Asia. Although cobras can hear, they rely on ground vibrations instead of the sounds humans hear. The snake charmer’s movement of his flute entices the cobra, not the music he plays. Seven-year-old Lakshmi [LAHK-shmee] and her mother scoured the forest near their home in southern India for firewood to sell in the marketplace. As Mother stooped to pick up a piece of wood, she saw an anthill nearby. Recognizing the ant hill as the home of a king cobra snake, who she worshiped as a god, Mother reached for her bottle of milk and poured some on the anthill. Then she stepped back, closed her eyes and and began praying softly. While she was still praying, a king cobra slithered out of the anthill toward Mother. Hissing, the snake curled around her left leg and buried its fangs into her leg. Only then did Mother scream. Mother stopped screaming and repeated, “Jesus save me! Jesus save me! Jesus save me!” As she prayed, the snake slowly slid down her leg and disappeared into the anthill. Mother tore a strip of cloth off her sari [dress] and tied a tourniquet on her leg to help prevent the venom from spreading. Then mother and daughter hurried home. When the two arrived at their small house, Mother sat down and examined her leg. She was surprised that the site of the bite wasn’t red or swollen, and she didn’t feel a lot worse after hurrying home. She had never heard of someone surviving a king cobra’s bite before. But she actually felt well. She washed her wound and sat down to rest. “How did you know to ask Jesus to save me?” Mother asked Lakshmi. Mother knew that the boarding school Lakshmi attended was a Christian school, but she knew very little about God. In fact, she hadn’t known the school existed until she was riding on a public bus. A man had offered her his seat and then began talking. During their conversation the man said he was a pastor and mentioned James Memorial Higher Secondary School to her and even offered to help pay Lakshmi’s tuition! Mother agreed, and Lakshmi enrolled in a fine school. Now mother quizzed Lakshmi about the God named Jesus, who had just saved her from a deadly snake bite. “He is the God of the universe,” Lakshmi said, excited. “It’s good to worship God, who created our world, rather than created beings who live in this world.” Mother nodded slowly. Lakshmi shared everything she could remember about Jesus as the two rested in the shade. Word spread of Lakshmi’s mother’s snakebite, and people were amazed that she had escaped harm. The fang marks on Mother’s leg were proof enough that her life had been spared by a God who was more powerful than any of the gods they had worshiped before. Lakshmi taught her mother to pray and read the Bible. Today Mother relies on God fully. Every Sabbath she invites her neighbors to join her as she walks to the little Adventist church in her village. 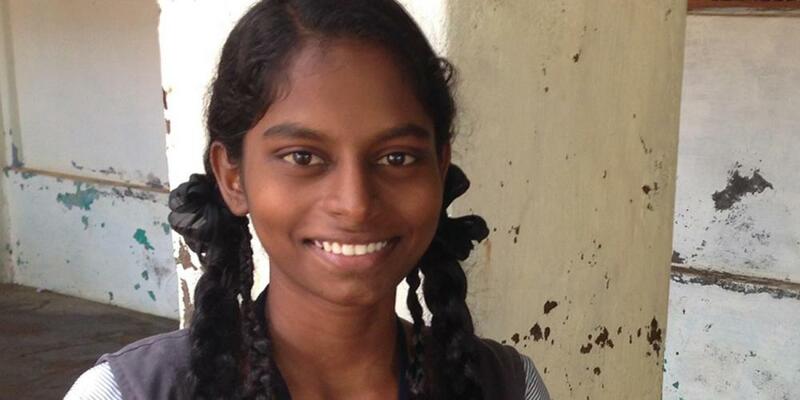 Lakshmi continues to learn more about God as she attends James Memorial Higher Secondary School. Part of this quarter’s Thirteenth Sabbath Offering will help build a new girls’ dormitory to replace the old one that is no longer a healthy place to live. Please remember this school in your prayers and with your Sabbath School mission offerings.